I have another great giveaway to bring my readers from UPrinting.com. 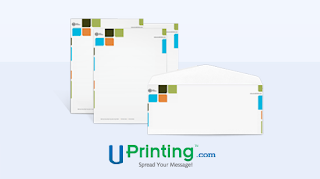 UPrinting.com is a terrific site for anyone interested in creating business cards, flyers, invitations, canvas prints, letterheads and so much more. Did you know that you can create your own custom letterhead for your blog or business? Think about how professional your pitch will look to companies when you are contacting them to sponsor a giveaway. I went online and I created my own letterhead design in under 5 minutes. It was so easy and you can either upload your own image like I did, or choose from the images that they have available. I really liked the way it turned out and how simple it was to create. You can also have envelopes printed to go with your letterhead. Turnaround time is really fast, they ship in two or four business days, plus, shipping is free! Go over to their website and see just how easy it is to create professional products for your blog or business. One lucky reader will receive custom letterhead from UPrinting.com. This contest ends on August 18th 2011 at 11:59 EST. This contest is open to US residents 18 years of age and older only. The contest will be run through Rafflecopter. No entries through the blog will be accepted.